When I was still pregnant with my daughter, my friend asked me if I planned on using a certain brand of formula for my daughter. I told her I have nothing in mind yet. I want the formula that has the complete nutrition my daughter needs as a growing baby. My friend then asked me if I heard about Member's Mark formula that is available at Sam’s Club. So I did my research and found out that Member’s Mark is just like the other branded formula that meets all strict FDA guideline offering complete nutrition for the baby’s health and development but at a lower price. It also contains DHA & ARA to help support brain and eye development. So why do I have to spend more money on a branded formula while I could get one that can give me savings. If you want to know how much you can save by buying Member’s Mark, you can go to http://www.membersmarkformula.com/and access the “Savings Calculator.” My daughter is now a little girl but every time we go to Sam’s Club we always pass by the baby formulas and she knows that Member’s Mark was her milk when she was a baby but recently we noticed that Member’s Mark has a new packaging with easy to read product type, age and benefit indicators. I immediately grabbed one can and checked the labels. It is still the same formula; only the packaging has changed. I like the new design and I also visited their fan page on facebook. This is the a picture of the american classic burger at Smash Burger. The meat is all angus beef patty with american cheese. ketchup, onion and pickles on an egg bun. You have the option to get a 1/3 lb burger or the 1/2 lb. On the side, I have the haystack onions. Their fries are good too and not greasy but I prefer the onions than fries. Yummy, Yummy! Since I was a child I enjoyed going hiking with my family. Sometimes what we did was not really considered hiking; the main reason was because we simply trekked out in the woods near our house on family outings and sometimes camped out. It was fun because the area in Alaska that I lived at the time was full of wilderness and mountain ranges, making this a very eventful occasion. Nowadays I go hiking all over the place with my family, friends, and even by myself at times. There are many great places to hike in Alaska but the best is to simply pick a place and go. This gives the excitement of embarking on a new adventure into the wilderness, with nothing but the belongings on your back and a goal in mind. The best thing about this is that I can simply set myadt Home Alarm system and be assured that nothing will happen to my house when I leave. The constant change of weather in Alaska also makes for a challenge. If it is too rainy then some places are unable to be hiked in, but there are always others. The massive lakes in the state are lovely to hike around and near because there is a bounty of lovely things to see at all times. Even in the winter time there are places to hike. I was tagged on Facebook by my niece and the caption is Gotcha! She caught me and hubby on our way to Smash Burger. 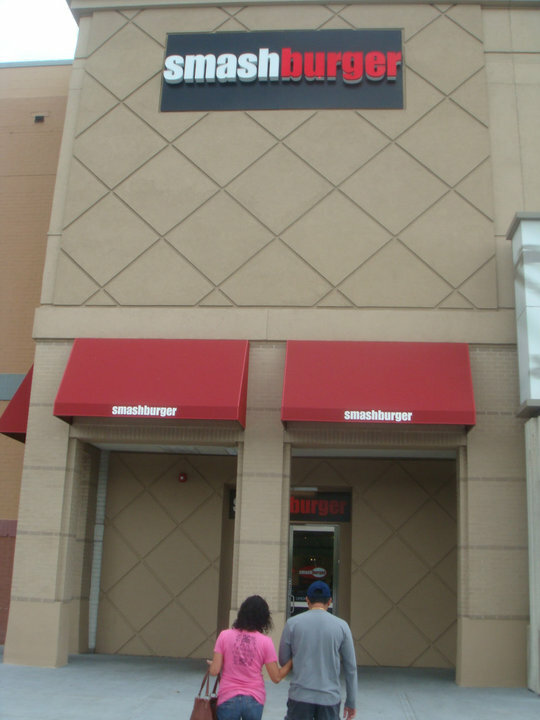 This is the new smash that recently opened in Hackensack, NJ. At their website, the address says: hackensack ave and commerce way. If you are using a GPS, you will get a little confuse because when the gps says "you have arrived" you don't see the restaurant at the corner of hackensack ave and commerce way. It is inside the Riverside mall on hackensack ave. It would have been a lot easier if the website will just say Riverside Mall. Anyway, we are very sure we won't get lost again. We were there twice already. Yum. Yum. The talk of the town in the Filipino community today is Charice, the Filipina sensation who was discovered on You Tube by Oprah, who is now on Glee Season 2. Her first episode was last night playing the role of an international student who auditioned as a new member of Glee. Charice performance singing the song “Listen” from Dreamgirls was outstanding. As a Filipina, it makes you proud seeing another Filipina shine on American TV. By the way, her name of Glee is Sunshine Corazon. So I made a post on facebook to all my friends to watch out for glee tonight and see charice. A lot was not able to watch the show because of work so they have been messaging me if I recorded the show on Tivo. Of course, I did. My friends know that there is no chance for me to be watching Fall TV shows between 7-9pm because that is the dinner, homework and bedtime for my daughter. I am just happy for what my Tivo can do and with its new TiVo Premiere features. With its new interface, it makes my browsing on what TV shows to watch a lot easier. And, here is what so cool with TiVo. They also have the Slide Remote where you slide the bottom of the remote and a full QWERTY keyboard hidden underneath is out making my searches of shows so easy and fun. I feel like I am just texting on TiVo. You don’t have TiVo yet? I am inviting you all to go to TiVo’s Facebook Fan Page to know more about their products and learn how you will never miss your favorite TV shows and movies anymore. With TiVo, you can control everything in the palm of your hands. To get your own TiVo, be sure to Enter to Win the sweepstakes “30 Slides in 30 Days” and win a new TiVo Slide. One TiVo Slide is given everyday but hurry because this contest ends soon. Good Luck! This yummy looking tacos are from Frijole Mexican Grill Restaurant. The place is like Qdoba or Chipotle set up but a smaller one less the crowd. They serve burritos, fajitas, tacos, quesadilla and salad - all made of fresh and healthy ingredients. You pick what you want and they make how you like it right there in front of you. I got a beef taco on a hard shell (you can mix) with shredded beef, onions, tomotoes and lettuce. It was yummy good. Price is around $5-6 bucks! No Tip, It's All About Service! Would other fast food restaurants be following this? I was at Red Ribbon Bakeshop to buy some cakes and pastries for my friend from MD. Of course, I have to buy my favorite cake too - the Ube Cake. Hubby was complaining because what he wanted was the Ube Macapuno cake but I grabbed the wrong one. The ube macapuno has macapuno on top and in between layers. The plain ube was as yummy as well. My kababayan friend who lives in Maryland was in Jersey over the weekend to visit a family friend. She called me if we can meet this time. I have been wanting to see her too but the last time she was here in Jersey (about 2 months ago), we were out of town. This time I made sure we see each other. So finally we met. I went to see her at her friend's house. She brought me these famous Maryland delicacy - the Maryland blue crabs. First time for me to taste Maryland crabs and they are delicious. My friend says, you can buy fresh or cooked. These are the cooked ones and the spices are just excellent. I can't wait to get home and eat those crabs. Kamayan na! They were yummy! Thanks Iv!